Jason Foundation - The Jason Foundation series of online Staff Development Training Modules provide information on the awareness and prevention of youth suicide suitable for teachers, coaches, other school personnel. These modules are provided at no cost to participants. Each module is designed for a two-hour block of time. Kognito - Kognito provides online, interactive training programs for mental health, suicide prevention, and other topics. Their proprietary Kognito Conversation Platform allows participants to implement learnings through role-play conversations with emotionally responsive virtual humans. Participants receive feedback and suggestions after these conversations are completed. Participants also receive a course summary, summary of best practices, and/or a listing of local and national resources. Kognito At Risk Courses are available free of charge on the Montana Teacher Learning Hub. Question, Persuade, Refer (QPR) - Just like CPR, QPR is an emergency response to someone in crisis and can save lives. QPR is the most widely taught Gatekeeper training in the world and can be provided in a three-hour in-person session with your staff in groups up to 30 people. 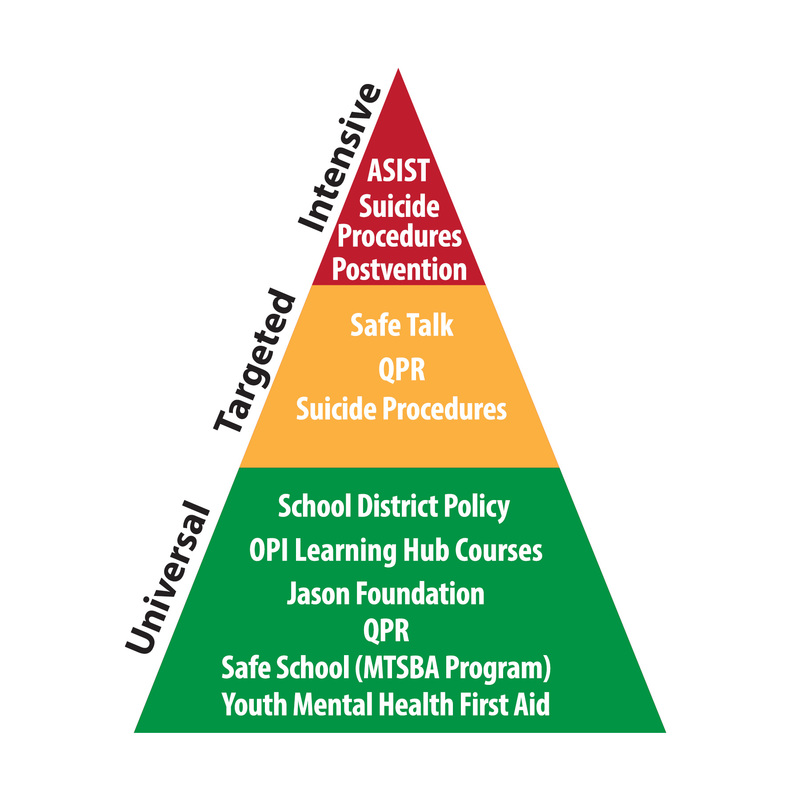 Safe Schools - School districts that participate in MTSBA’s Montana Schools Group Insurance Authority (MSGIA) property and liability program have free access to online trainings in the area of Youth Suicide Awareness and Prevention. The two-hour online course meets the requirements of the Jason Flatt Act and offers school staff members an awareness-level understanding of the facts about youth suicide, causes of youth suicide, basic principles of suicide prevention and planning for the aftermath of a suicide within the school community. School District Policy - House Bill 381 now states that trustees of a school district shall establish policies, procedures, or plans related to suicide prevention and response. It is critical for schools to train their staff on the district policy regarding suicide prevention and response. Youth Mental Health First Aid - Youth Mental Health First Aid is an eight hour in-person training designed to teach parents, family members, schools, and others how to help an adolescent (age 12-18) who is experiencing a mental health or addictions challenge or is in crisis. This training is provided free of charge. Safetalk - SafeTALK is a half-day in person alertness workshop that prepares anyone over the age of 15, regardless of prior experience or training, to become a suicide-alert helper. SafeTALK-trained helpers can recognize suicide invitations and take action by connecting them with life-saving intervention resources, such as caregivers trained in ASIST. Suicide Procedures - House Bill 381 now states that trustees of a school district shall establish policies, procedures, or plans related to suicide prevention and response. It is critical to train staff on these protocols so staff know how to handle a situation appropriately and aligned with district procedures. The Montana Teacher Learning Hub has a three part series titled Overview of Youth Suicide, Suicide Prevention for Schools Part 1: Strategies, and Suicide Preventon for Schools Part 2: Protocols to assist in understanding the imact of youth suicide, strategies for prevnetion, and sample policies and procedures. ASIST - Applied Suicide Intervention Skills Training (ASIST) is a 16-hour in-person training for anyone 16 or older, regardless of prior experience, who wants to be able to provide suicide first aid. Shown by major studies to significantly reduce suicidality, the ASIST model teaches effective intervention skills while helping to build suicide prevention networks in the community. Suicide Procedures - House Bill 381 now states that trustees of a school district shall establish policies, procedures, or plans related to suicide prevention and response. It is critical to train staff on these protocols so staff know how to handle a situation appropriately and aligned with district procedures.